QuickBooks software is specially designed to maintain all financial and accounting activities. It helps to organize all the business income and expenses in small, medium or large sized business houses. This software has other additional advantages of managing the payroll services, integrates itself with other useful programs and helps in exporting data too. However, at times, there are several factors responsible for disturbance in the normal workflow like improper updates, wrong action performed by the user or not shutting the system properly. One such feature of QuickBooks is to provide current and accurate rates for payroll calculation along with a whole lot of latest provincial and federal tax tables, tax forms and e-filing options, therefore, it’s important to download or install the latest payroll tax table in QuickBooks. 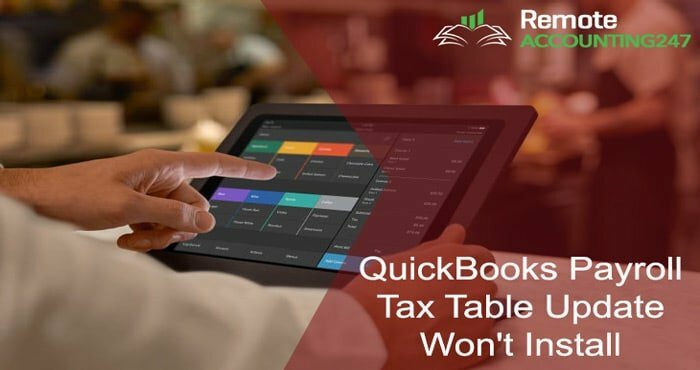 But several users face a typical problem which is freezing up of QuickBooks due to Payroll tax table not getting installed correctly. Error Description: This results in the user being unable to use the payroll function due to the program constantly freezing up and they have to exit many times out of the system by doing a ctrl+alt+del. If you notice carefully the File Doctor in update function indicates “install pending”. The reason for the error may be due to the fact that some of the payroll features may have got corrupted after the most recent update. Step 1: Initially, try to open the QuickBooks Desktop and run QuickBooks File Doctor tool which diagnoses and repairs your data files and prevents the trouble of freezing. Note: Download and run the most up-to-date version of QuickBooks File Doctor tool. Also, please be advised that QuickBooks File Doctor only works for QB Desktop for Windows and it’s NOT compatible with QuickBooks for Mac. After diagnosis, try to open the QuickBooks file again and check if the problem is resolved. Step 2: Once the above step is complete, then perform the “verify and rebuild” procedure that needs to be carried out to fix any possible issues of data or feature damages. Verify Data is meant to self-identify the most commonly known data issues in a company file. Rebuild Data in turn, self-resolves most of the data integrity issues spotted by Verify Data function. 4. If the Verify detects additional damages then these damage/s need to be manually corrected. To locate additional errors, you can seek the help of Remoteaccounting247 QuickBooks help team who can help you locate additional errors and gives you a step-by-step resolution for the problem and helps you get your QuickBooks Payroll up and running. Contact RemoteAccounting QuickBooks Experts Team Anytime to Get the Right Help! Our RemoteAccounting QuickBooks payroll experts team work 24x7x365 and has a rich hands-on-experience in handling all types of errors faced by QuickBooks Pro, Premier, Desktop, Mac, Payroll users; whether the error is functional, configuration related or server or data related. You can call us on our RemoteAccounting247 QuickBooks toll-free number +1 (800) 961–6588 and speak to our specialists or engage in a one-on-one chat by clicking on the bottom left corner chat window. Alternatively, you can also write an email to us on ask@remoteaccounting247.com with your detailed query and one of our advisors will get in touch with the right resolution.